Does your organization consistently face issues with travel and expense policy enforcement? You’re not alone. Corporate expense policies are highly complex and can be a huge headache if not handled effectively and efficiently. No two organizations have the same policy for out-of-pocket expenses and therefore it’s critical to use an automated expense management solution with a highly configurable business rules engine for consistent enforcement of your organization’s expense policy. Without this, any policy is virtually impossible to enforce, and is likely to exist only on a complex spreadsheet. This whitepaper outlines some of the largest challenges that organizations face when it comes to T&E policy enforcement. 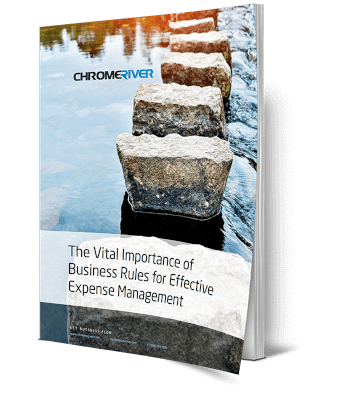 The report suggests automating your expense policy via the business rules engine of your expense management solution. The business rules scrutinize all expense reports equally to resolve issues such as non-compliance, employee expense fraud, leakage due to incorrectly categorized spend, as well as low employee morale due to inconsistent policy rules. Download the whitepaper using the form to the right and investigate solutions to your expense policy enforcement challenges. And when you're ready to learn more, we're here to help. After all, Chrome River lets business flow.